After receiving a final radiation treatment at Good Samaritan Hospital, a member of the Westchester Medical Center Health Network (WMCHealth) in Suffern, cancer patients can now mark the milestone by tugging a rope to ring the “New Beginning Bell” in the Radiation Oncology Unit. The bell begins a celebration marking the completion of a patient’s treatments. The bell arrived at the hospital thanks to 15-year-old Ardsley resident Isabella Spar, who included it as part of her bat mitzvah project, titled “Project Bell.” Inspired by her mother’s successful radiation therapy for a benign brain tumor, she sells homemade bracelets on her website, ProjectBell.org, to fund the installation of bells at other area cancer treatment centers. 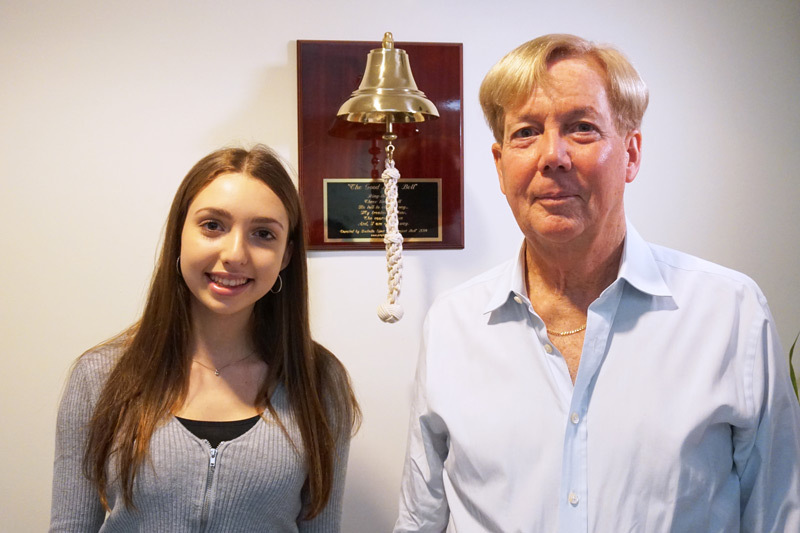 Photo Caption: Patient Cliff Nyman with Isabella Spar, who donated the bell.